YOKOSUKA, Japan (NNS) – The Ticonderoga-class guided missile cruiser USS Shiloh (CG67) departs Commander, Fleet Activities Yokosuka, Sept. 8. 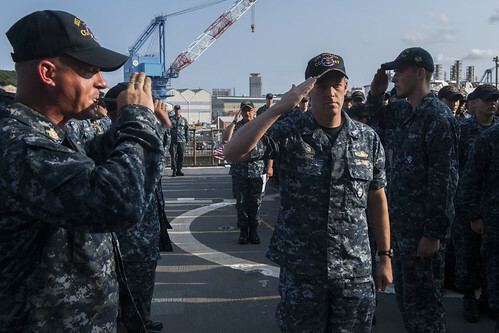 YOKOSUKA, Japan (NNS) – Capt. Robert “Bo” Johns relieved Capt. Adam Aycock as the commanding officer of the Ticonderoga-class guided-missile cruiser USS Shiloh (CG 67) during a change of command ceremony, Aug. 30. CORAL SEA (NNS) – Midshipmen, visiting the forward-deployed Ticonderoga-class guided-missile cruiser USS Shiloh (CG 67), were given the opportunity to serve as conning officers during a replenishment-at-sea, Aug. 5. BRISBANE, Australia – Sailors, assigned to the forward-deployed Ticonderoga-class guided-missile cruiser USS Shiloh (CG 67), participated in a community relations project at the Aboriginal and Islander Independent Community School (Murri School), July 25. CORAL SEA (NNS) – On the final day of Talisman Saber 2017, the Ticonderoga-class guided-missile cruiser, USS Shiloh (CG 67), closed with HMAS Canberra (L02), an Australian Landing Helicopter Dock (LHD) ship, while in formation with 20 other ships. 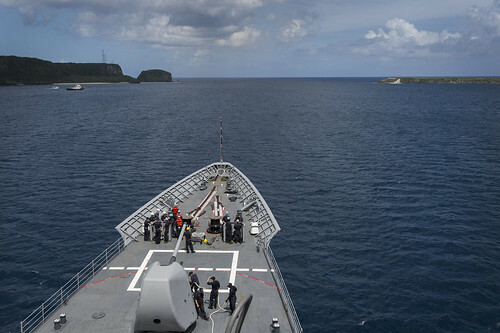 CORAL SEA (NNS) – The forward-deployed Ticonderoga-class guided-missile cruiser USS Shiloh (CG 67) had the highest number of Sailors advance from the Cycle 235 Advancement Exam out of all the cruisers in U.S. 7th Fleet.